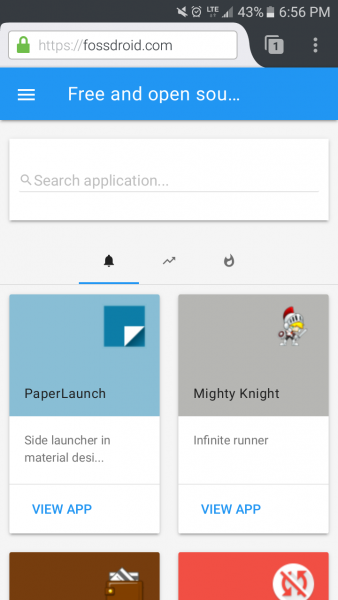 Fossdroid is a web interface for the F-Droid app repository that mimics the look and feel of the Play Store. Fossdroid is an alternate web interface for the F‑Droid repository of open source apps for the Android operating system. 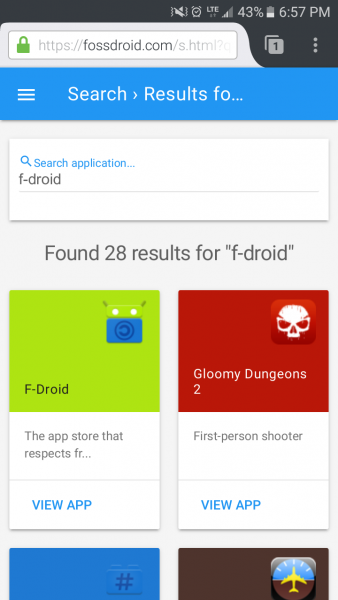 Unlike the official F‑Droid website, Fossdroid's design is based on the Google Play Store, which gives users who have never used an external app repository a familiar interface to search, browse, and install Android apps. 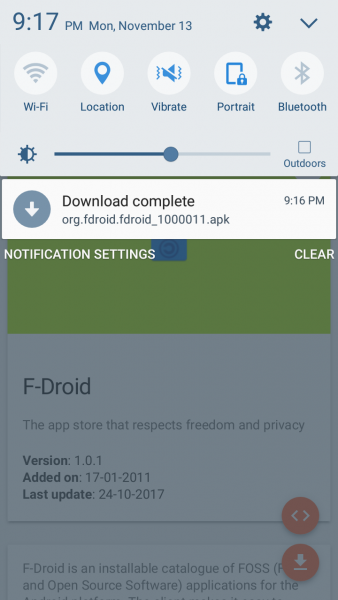 Users who use a lot of F‑Droid apps should install the F‑Droid app, which can install apps and keep them automatically updated, but Fossdroid provides a nice way to explore what the F‑Droid repository offers. Here's how to use the Fossdroid website to find, download, and install apps. The Fossdroid homepage has a Play Store inspired look and feel. The interface is not exactly the same, but it's close enough to be familiar to Android users. The homepage features a menu that lets a user browse by category, a search box, and a selection of apps displayed as individual tiles. The tiles can be sorted by recent, trending, or most popular apps. To browse the Fossdroid collection by category, tap the three horizontal bars icon in the top left corner of the webpage. 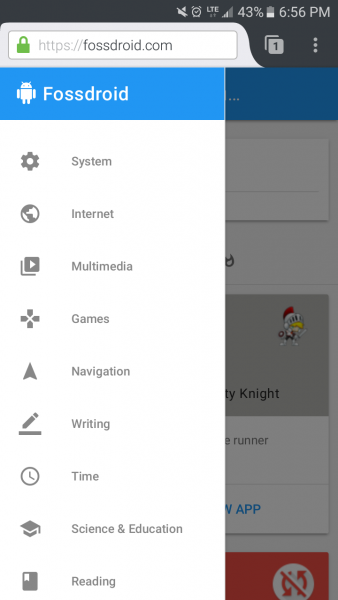 A menu will appear that contains all the categories of apps available. Select a category by tapping on it, which will open a page with all the apps in that category. Like the homepage, the category pages can be sorted by recent, trending, or most popular. To search for an app, either by name or by function, enter the search terms in the "Search application..." box on the homepage. This will open a page listing the apps that match the search results. The search function can also be accessed by tapping on the magnifying glass icon in the top right corner of the webpage on both category and individual app pages. Tapping on the "view app" link in an app's tile opens the app's information page. This page shows all the information about the app, including its name, version number, when it was added to the F‑Droid repository, when it was last updated, a written description, and screenshots. 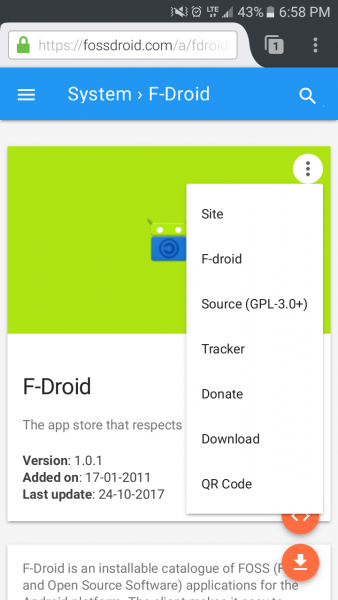 Tapping the three vertical dots brings up a menu with links to the app's official website, F‑Droid page, source code, issue tracker, donation information, APK file, and a QR code linking to the APK file. For quick access, the icon with angle brackets at the bottom right of the screen links to the app's source code, and the down-arrow icon downloads the app's APK file. There is also a comment section to discuss the app, but most apps on Fossdroid have no comments. To download an app from its Fossdroid page, tap on the orange down-arrow icon in the bottom right of the screen, or tap on the three vertical dots in the upper right of the page and select Download. Either way, the APK file will start downloading. Once the download is complete, tap on the Android download-complete notification to begin installing the app. A screen will appear describing the permissions the app needs to operate and offering the option to install or cancel. Tap on Install to install the app. Once installation is complete, tap on the app's icon in the list of installed apps to start it. Note that if you have never installed apps from a non-Play Store source before, a message indicating that the installation was blocked may appear after tapping on the Download notification. 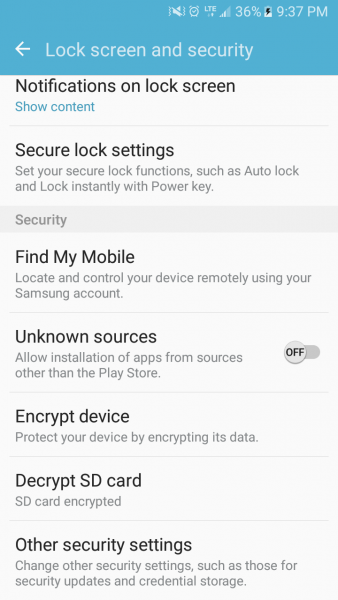 If it does, tap on Settings in the notification, which will open a settings page with the option to change the security settings. Change the Unknown Sources setting to On and tap OK in the dialog box that opens. Fdroid is a fantastic resource, and is my first stop when looking for any application. I quite like its new native interface, but it's nice to know about this alternative. F-Droid is fantastic, and the app's not too bad. But the website doesn't offer as good an experience as Fossdroid. As you said, though, it's nice to have both. F-droid app is really nice, I use it often but website and both web versions are not as good. They should improve web experience.